Why do we need vitamins and what is the importance of vitamins in the human body, anyway? That is what we shall begin to address in a series of blogs as we continue to look at developing a healthy lifestyle. Every day that we are alive our body is carrying on hundreds of processes. Your body must carry on building and maintaining structures, it must maintain transportation devices and thoroughfares, it has to replace and repair parts, it must maintain a communication system between the control center(the brain) and every other part of the body. Your body must take in raw materials and convert them into usable products for the body. To do all this, and more, your body must have at least 30 dietary components, vitamins and minerals, which it can not produce or can not produce in large enough quantities. When we mention “large enough quantities”, we are not talking about grams or ounces, we are talking about milligrams and .000 oz. There is a difference between vitamins and minerals. Vitamins are organic materials and can be acted on by acids or heat or even air. Because of this, vitamins and their effectiveness can be affected by cooking or storage methods or exposure to certain environments. Because of this the best sources of vitamins in foods are those that have the least processing involved in getting them to the consumer. Minerals, on the other hand, are inorganic. Because of this they maintain their chemical structure and can easily be introduced into your body through the foods that you consume. There are two types of vitamins that your body absorbs. 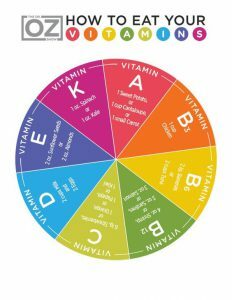 There are the water-soluable vitamins and the fat-soluable vitamins. We shall mention just a word about antioxidants. They have taken on a popularity which may not be duly deserved. Your body produces plenty of antioxidants to combat the free radicals which may invade your body. The term “antioxidant” does not denote a nutrient but is a description of a chemical property. If you do take supplements that are antioxidants it is important that you do not take more than the recommended dosage. Taken in to high dosages may cause more harm than good. The safest approach is to eat a balanced diet and let your body produce the antioxidants needed. Your doctor will be the best adviser. This has been an introduction to vitamins. Over the coming days and weeks we shall look at the individual vitamin to see how it fits into our health and maintenance of our body. We shall seek to give you good sources of obtaining the vitamins and supplements that you may need to carry on a vigorous and healthy lifestyle. Please, feel free to check out any of the suppliers that we shall recommend and then if need be, check with your physician. We shall only recommend suppliers that give only the highest quality products available. Please leave a comment or ask a question and we shall do our best to point you to where you can get help or answers to your question.